The Walking Dead S9.07 review: "A disappointing return to slow paced, dispensable inaction"
We knew it was coming. There was no way The Walking Dead season 9 could maintain its winning streak for this long. This is The Walking Dead after all. No season has been a pitch perfect run of hit after hit. There’s always, at the very least, one throwaway episode that does little to further the themes, plot, or character arcs of the show. For The Walking Dead season 9, the first (and hopefully last) of those episodes is Stradivarius, which poorly follows on from What Comes After and Who Are You Now?, two fantastic chapters that took the show’s story in bold, unexpected directions. Comparatively, even with its shortened runtime, you can practically hear the creaky gears grinding in the background of Stradivarius, which moves the pieces in place for the mid-season finale, but achieves little else. At least AMC has finally clarified how Lauren Cohan has left the show following Maggie’s final appearance in The Walking Dead season 9 episode 5. Turns out she’s migrated to The Commonwealth to help Georgie start up another new community, leaving Hilltop under the leadership of Jesus but letting few outside of its walls know about her departure. Indeed, Michonne is shocked upon hearing the news from Sadiq, but we learn that Maggie’s presence at Hilltop has been the sole obstacle preventing her from visiting, suggesting the two haven’t been on rosy terms for some time. The revelation hits Michonne during her journey from Alexandria alongside Sadiq, DJ, and the quarters of new survivors introduced in the previous episode, as they make their way to their new home at Hilltop. Whereas characters have frequently zigzagged between these two communities within a split second over the last three seasons, Stradivarius spends at least half of its runtime tracking the group’s commute as though it were a Homeric odyssey, where they come to learn more about each other along the way, in spite of Michonne’s paranoid suspicions. While it’s important to spend time with these new characters to build up audience investment, Stradivarius doesn’t make the most of the extended breathing room. We get yet another reminder that Magna is a hothead with a temper (because The Walking Dead definitely needs another one of those), are properly introduced to the more reasonable Yumiko, and learn that Luke has a fetish (Connie’s words, not mine) for finding and restoring musical instruments across the apocalypse. Oh, and all three continue to wax lyrical about Bernie, their dead friend who we’ve never even seen or met, since he bit the bullet off screen before he could say hello. We get it, guys. Your friend died. But how does this add anything to our understanding of these characters and the story elements they’re now part of? The stronger focus of the episode was with Carol, Henry, and Daryl, in which the former visits the makeshift guerilla camp of the latter to try and persuade him to look after Henry while he studies blacksmithing at Hilltop. There are some fun little nuggets of flashforward character developments here that elevates Carol and Henry’s pit stop out of potential drudgery. Daryl now owns a dog (who, in true Daryl form, has been named “Dog”), having spent the past six years looking for Rick, troubled by the fact that his body never showed up after the events of the bridge collapse. Of even more interest, our hillbilly marksman also bears those same, garish scars across his back that we saw on Michonne last episode, once again alluding to some horrific event we’ve yet to learn of. I reckon we’re in store for some painful flashbacks in the second half of season 9. In any case, despite some reluctance, Daryl succumbs to Carol’s petitioning and agrees to return to Hilltop, only to discover that Rosita has been injured and Eugene is still missing after a run in with The Whisperers. Sadly, we don’t get a better look at those iconic villains aside from a hazy, nonadditive scene at the beginning of the episode, but I’m pretty certain AMC is saving their proper debut for the mid-season finale’s big cliffhanger. Otherwise, the best I can say about Stradivarius was that, as another fleeting mid-season affair with lightheartedness for The Walking Dead, it holds some agreeable pockets of black comedy. Daryl’s dog’s habit for bringing him rotting body parts every day as though he were delivering newspapers is an especially brilliant detail, while Luke using Makaton to sarcastically convey his gratitude to Connie after being saved from a Walker almost felt like something out of an Edgar Wright movie. Other than that, and the soaring, peppy final shot, it’s hard to find much else to praise. When your seasons are 16 episodes long (which, let’s face it, is too long by anyone’s standards), you’re bound to have a handful of non-eventful duds, but Stradivarius notably takes the wind right out of The Walking Dead season 9’s sails, perhaps because everything else until now has been so consistently entertaining. The show’s mid-season finales tend to break up the airtime with a more exciting mini climax, so here’s hoping The Walking Dead can end 2018 on a high note. 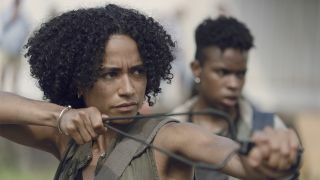 Verdict: A disappointing return to slow paced, dispensable inaction for The Walking Dead, Stradivarius held only glimpses of greatness throughout a filler episode of unremarkable inertia.